And how many potentially exploding stars are located within the unsafe distance? A supernova is a star explosion – destructive on a scale almost beyond human imagining. If our sun exploded as a supernova, the resulting shock wave probably wouldn’t destroy the whole Earth, but the side of Earth facing the sun would boil away. Scientists estimate that the planet as a whole would increase in temperature to roughly 15 times hotter than our normal sun’s surface. What’s more, Earth wouldn’t stay put in orbit. The sudden decrease in the sun’s mass might free the planet to wander off into space. Clearly, the sun’s distance – 8 light-minutes away – isn’t safe. Fortunately, our sun isn’t the sort of star destined to explode as a supernova. But other stars, beyond our solar system, will. What is the closest safe distance? Scientific literature cites 50 to 100 light-years as the closest safe distance between Earth and a supernova. 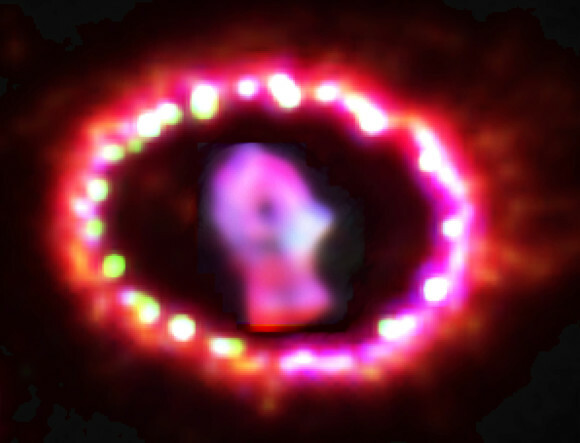 Image of remnant of SN 1987A as seen at optical wavelengths with the Hubble Space Telescope in 2011. This supernova was the closest in centuries, and it was visible to the eye alone. It was located on the outskirts of the Tarantula Nebula in the Large Magellanic Cloud, a satellite galaxy to our Milky Way. It was located approximately 168,000 light-years from Earth. Image via NASA, ESA, and P. Challis (Harvard-Smithsonian Center for Astrophysics). What’s more, if a supernova exploded within 30 light-years, phytoplankton and reef communities would be particularly affected. Such an event would severely deplete the base of the ocean food chain. Suppose the explosion were slightly more distant. An explosion of a nearby star might leave Earth and its surface and ocean life relatively intact. But any relatively nearby explosion would still shower us with gamma rays and other high-energy radiation. This radiation could cause mutations in earthly life. Also, the radiation from a nearby supernova could change our climate. No supernova has been known to erupt at this close distance in the known history of humankind. The most recent supernova visible to the eye was Supernova 1987A, in the year 1987. It was approximately 168,000 light-years away. Before that, the last supernova visible to the eye was was documented by Johannes Kepler in 1604. At about 20,000 light-years, it shone more brightly than any star in the night sky. It was even visible in daylight! But it didn’t cause earthly effects, as far as we know. How many potential supernovae are located closer to us than 50 to 100 light-years? The answer depends on the kind of supernova. A Type II supernova is an aging massive star that collapses. There are no stars massive enough to do this located within 50 light-years of Earth. But there are also Type I supernovae – caused by the collapse of a small faint white dwarf star. These stars are dim and hard to find, so we can’t be sure just how many are around. There are probably a few hundred of these stars within 50 light-years. The star IK Pegasi B is the nearest known supernova progenitor candidate. It’s part of a binary star system, located about 150 light-years from our sun and solar system. 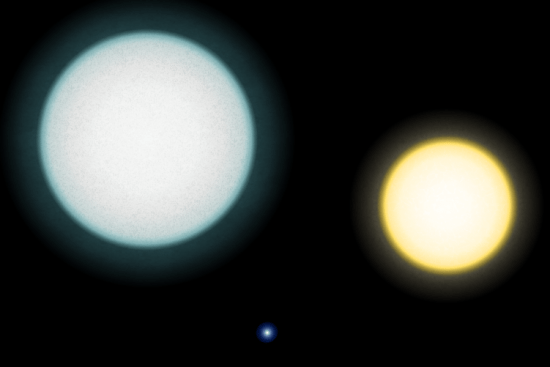 Relative dimensions of IK Pegasi A (left), IK Pegasi B (lower center) and our sun (right). The smallest star here is the nearest known supernova progenitor candidate, at 150 light-years away. Image via RJHall on Wikimedia Commons. The main star in the system – IK Pegasi A – is an ordinary main sequence star, not unlike our sun. The potential Type I supernova is the other star – IK Pegasi B – a massive white dwarf that’s extremely small and dense. When the A star begins to evolve into a red giant, it’s expected to grow to a radius where the white dwarf can accrete, or take on, matter from A’s expanded gaseous envelope. When the B star gets massive enough, it might collapse on itself, in the process exploding as a supernova. What about Betelgeuse? Another star often mentioned in the supernova story is Betelgeuse, one of the brightest stars in our sky, part of the famous constellation Orion. Betelgeuse is a supergiant star. It is intrinsically very brilliant. Such brilliance comes at a price, however. Betelgeuse is one of the most famous stars in the sky because it’s due to explode someday. Betelgeuse’s enormous energy requires that the fuel be expended quickly (relatively, that is), and in fact Betelgeuse is now near the end of its lifetime. Someday soon (astronomically speaking), it will run out of fuel, collapse under its own weight, and then rebound in a spectacular Type II supernova explosion. When this happens, Betelgeuse will brighten enormously for a few weeks or months, perhaps as bright as the full moon and visible in broad daylight. When will it happen? Probably not in our lifetimes, but no one really knows. It could be tomorrow or a million years in the future. When it does happen, any beings on Earth will witness a spectacular event in the night sky, but earthly life won’t be harmed. That’s because Betelgeuse is 430 light-years away. How often do supernovae erupt in our galaxy? No one knows. Scientists have speculated that the high-energy radiation from supernovae has already caused mutations in earthly species, maybe even human beings. One estimate suggests there might be one dangerous supernova event in Earth’s vicinity every 15 million years. Another says that, on average, a supernova explosion occurs within 10 parsecs (33 light-years) of the Earth every 240 million years. So you see we really don’t know. But you can contrast those numbers to the few million years humans are thought to have existed on the planet – and four-and-a-half billion years for the age of Earth itself. And, if you do that, you’ll see that a supernova is certain to occur near Earth – but probably not in the foreseeable future of humanity. ‘The whole world got excited’ when this nearby star exploded. This artist’s illustration of SN 1987A depicts what the exploding star may have looked like from a position much closer than Earth. Ian Shelton was alone at a telescope in the remote Atacama Desert of Chile. He had spent three hours taking a picture of the Large Magellanic Cloud. This wispy galaxy orbits our own, the Milky Way. Suddenly, Shelton was plunged into darkness. High winds had taken hold of the rolltop door in the observatory’s roof, slamming it shut. “This was maybe telling me I should just call it a night,” recalls Shelton. It was February 23, 1987. And that evening, Shelton was the telescope operator at Las Campanas Observatory. He grabbed an 8-by-10 inch glass plate from the telescope’s camera. It had caught an image of the night sky. But it was only a negative. So Shelton headed off to the darkroom. (Back then, photographs had to be developed by hand from negatives instead of appearing instantly on a screen.) As a quick quality check, the astronomer compared the just-developed picture with one he had taken the night before. And one star caught his eye. It hadn’t been there the previous night. “This is too good to be true,” he thought. But to be sure, he stepped outside and looked up. And there it was — a faint point of light that wasn’t supposed to be there. He walked down the road to another telescope. There, he asked astronomers what they could say about an object that bright appearing in the Large Magellanic Cloud, just outside the Milky Way. “Supernova!” was their response. Shelton ran outside with the others to double-check with their own eyes. In the group was Oscar Duhalde. He saw the same thing earlier that evening. They were witnessing the explosion of a star. This supernova was the closest seen in nearly four centuries. And it was bright enough to view without a telescope. With roughly 2 trillion galaxies in the observable universe, there’s almost always a star exploding somewhere. But a supernova close enough to be seen with the unaided eye is rare. In the Milky Way, astronomers estimate, a supernova goes off every 30 to 50 years. But until that time, the most recent one seen was in 1604. At a distance of about 166,000 light-years, the new one was the closest since the time of Galileo. 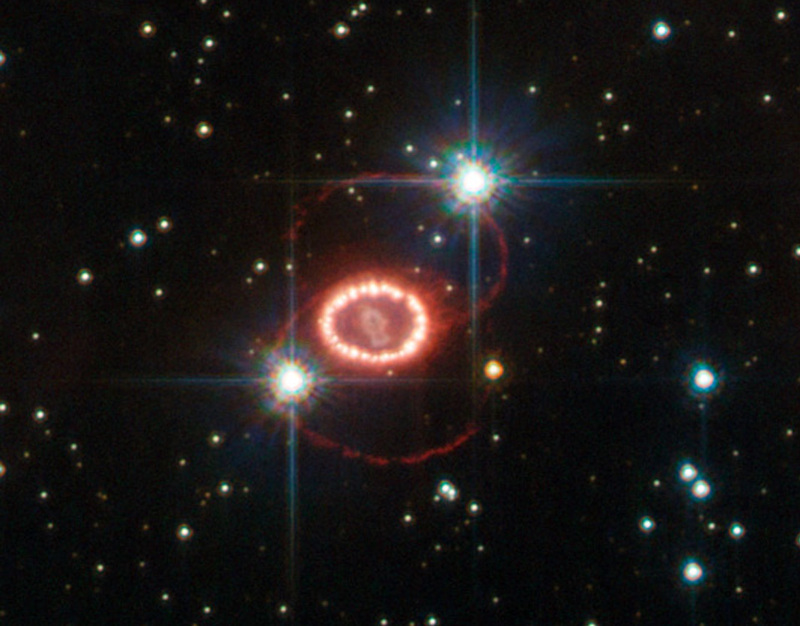 Astronomers would dub it SN (for supernova) 1987A (indicating it was the first of that year). Supernovas are “important agents of change in the universe,” notes Adam Burrows. He is an astrophysicist at Princeton University in New Jersey. Most heavyweight stars end their lives as supernovas. These explosive events also may trigger the birth of new ones. Such cataclysms can change the fate of entire galaxies by stirring up the gas needed to build more stars. Most chemical elements heavier than iron, perhaps even all of them, are forged in the chaos of such explosions. Lighter elements are created over a star’s lifetime and then spewed into space to seed a new generation of stars and planets — and life. 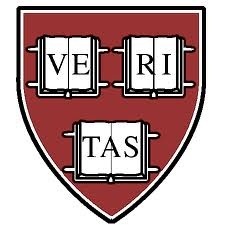 These include “the calcium in your bones, the oxygen you breathe, the iron in your hemoglobin,” Burrows explains. Thirty years after its discovery, supernova 1987A remains a celebrity. It was the first supernova for which the original star could be identified. And it spewed the first neutrinos — a kind of particle smaller than an atom — detected from beyond the solar system. Those subatomic particles confirmed decades-old theories about what happens in the heart of an exploding star. Today, the supernova’s story continues to be written. New observatories draw out more details as shock waves from the explosion keep plowing through the gas between stars. This animated video shows what happened on the night supernova 1987A was discovered. At first, there were doubters. “I thought, that’s got to be a joke,” says Stan Woosley. He is an astrophysicist at the University of California, Santa Cruz. But as word spread via telegram and telephone, it quickly became clear this was no prank. Amateur astronomer Albert Jones in New Zealand reported seeing the supernova the same night — until clouds moved in. About 14 hours after the discovery, NASA’s International Ultraviolet Explorer satellite was watching it. Astronomers around the world scrambled to redirect telescopes both on the ground and in space. “The whole world got excited,” Woosley remembers. “It was a daily adventure. There was always something coming in.” At first, astronomers suspected that 1987A was a type 1a supernova. This results from the detonation of a stellar core — one that is left behind after a star like the sun quietly sheds gas at the end of its life. But it soon became clear 1987A was a type 2 supernova. It was the explosion of a star many times heavier than our sun. Observations taken the next day in Chile and South Africa showed hydrogen gas hurtling away from the explosion at roughly 30,000 kilometers (19,000 miles) per second. That’s about one-tenth the speed of light. After the initial flash, the supernova faded for about a week but then resumed brightening for about 100 days. It eventually maxed out shining with the light of roughly 250 million suns! Since first spotted, SN 1987A has provided several surprises. But it didn’t lead to a fundamental shift in how astronomers think about these explosions, says David Arnett. He is an astrophysicist at the University of Arizona in Tucson. The general idea is that a type 2 supernova goes off when a heavyweight star runs out of fuel and can no longer support its own weight. This had been suspected for decades. It was largely confirmed by 1987A. Stars live in a delicate balance between gravity and gas pressure. Gravity wants to crush a star. High temperatures and extreme densities in the center of a star allow the nuclei of hydrogen atoms to slam together. This creates helium and frees lots of energy. That energy pumps up the pressure and keeps gravity in check. Once a star’s core runs out of hydrogen, it begins fusing helium into atoms of carbon, oxygen and nitrogen. And for stars like the sun, that’s about as far as they get. But if a star is more than about eight times as massive as our sun, it can go on to forge even heavier elements. All that weight on the core keeps the pressure and temperature extremely high. The star forges heavier and heavier elements until iron is created. Iron is not a stellar fuel. Fusing it with other atoms doesn’t release energy. In fact, iron saps energy from its surroundings. Without an energy source to fight against gravity, the bulk of the star now comes crashing down on its core. That core collapses on itself until it becomes a ball of neutrons. That ball can survive as a neutron star — a hot orb now only about the size of a city. But if enough gas from the dying star rains down on the core, the neutron star loses its own battle with gravity. What results is a black hole. Before that happens, the initial onrush of gas from the rest of the star hits the core and bounces back outward. This sends a shock wave back toward the surface, which tears the star apart. The ensuing explosion can forge elements even heavier than iron. More than half of the periodic table of elements may have been formed by supernovas. Newly formed elements aren’t the only things a supernova spits out. Neutrinos are too. These nearly massless subatomic particles barely interact with matter. Theorists had predicted that neutrinos should be released during the collapse of a star’s core — and in huge amounts. Despite their ghostly nature, neutrinos are suspected of being the main driving force behind the supernova. They are thought to inject energy into the developing shock wave. A lot of energy. They may, in fact, account for 99 percent of the energy released in such an explosion. Neutrinos can pass through the bulk of the star unimpeded. That means they can get a head start out of the star, eventually arriving at Earth before the blast of light. Confirmation of this prediction was one of the big successes from 1987A. Three neutrino detectors on different continents registered a nearly simultaneous uptick in neutrinos roughly three hours before Shelton recorded the flash of light. A detector in Japan counted 12 neutrinos. Another in Ohio detected eight. A facility in Russia detected five more. In all, 25 neutrinos turned up. That counts as a deluge in neutrino science. While the neutrinos were expected, the type of star that “went supernova” was not. Before 1987A, astronomers thought that only puffy red stars known as red supergiants would end their lives in a supernova. These are gargantuan stars. One nearby example: the bright star Betelgeuse in the constellation Orion. It is at least as wide as the orbit of Mars. But the star that exploded as 1987A had been a blue supergiant. Known as Sanduleak -69° 202, it was hotter and more compact than a red supergiant. Clearly, 1987A didn’t fit the mold. “SN 1987A taught us that we did not know everything,” Kirshner says. More surprises emerged after the launch of the Hubble Space Telescope three years later. Its early images were fuzzy. The reason was a now infamous defect in the telescope’s main mirror. Once corrective optics were installed in 1993, unexpected details of the fading explosion came into focus. “Those first pictures from Hubble were jaw-dropping,” says Shelton, who is now a teacher in the Toronto, Canada, area. A thin ring of glowing gas could be faintly seen in earlier images from the ground. Now, it encircled the site like a Hula-Hoop. Above and below that ring were two fainter rings. This trio formed an hourglass shape. “No other supernova had shown that kind of phenomenon,” says Richard McCray. He is an astrophysicist at the University of California, Berkeley. It is not because it doesn’t happen, he points out. No, it’s because other supernovas were too far away to be seen so well. The central ring spanned 1.3 light-years across and was expanding at about 37,000 kilometers (23,000 miles) per hour. The ring’s size and how quickly it was growing indicated that the star dumped a lot of gas into space about 20,000 years before it exploded. That could explain why Sanduleak -69 202 was a blue supergiant when it exploded. 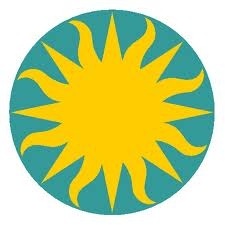 Some type of earlier outburst might have whittled the star down to expose hotter — and therefore bluer — layers. One leading idea for how the rings formed is that this star might be the offspring of two that once, long ago, locked into an orbit around one another. Eventually that stellar pair spiraled into each other. As they merged, some excess gas might have been expelled, forming a ring that aligned with the original orbit. Other gas may have funneled in the perpendicular direction. Rapid rotation of a single star or powerful magnetic fields also might have directed gas from an eruption into a loop around the star. The primary ring has gotten only more intriguing with time. In 1994, a bright spot appeared on the ring. A few years later, three more spots emerged. By January 2003, the entire ring had lit up with 30 hot spots. All were drifting away from the center of the explosion. “It was like a necklace of pearls,” Kirshner says — “a really beautiful thing.” A shock wave from the supernova had caught up with the ring and started to heat up clumps of gas. A ring of hot spots gradually lit up in images from the Hubble Space Telescope as a shock wave from supernova 1987A plowed through a loop of gas. That gas had been expelled by the star tens of thousands of years before the explosion. By now, the hot spots are fading as new ones are showing up outside the ring. Given how quickly the spots are waning, the ring will probably disintegrate sometime in the next decade. “In a way, this is the end of the beginning,” Kirshner concludes. One of the enduring mysteries of 1987A is what became of the neutron star that formed at the heart of the explosion. “It’s a cliffhanger,” Kirshner says. “Everybody thinks that the neutrino signal means that a neutron star formed.” But there’s still no sign of it, despite three decades of searching with many different types of telescopes. A triplet of rings frames supernova 1987A (top) in this image taken by the Hubble Space Telescope. The rings, arranged in an hourglass shape (bottom illustration), probably formed from gas blown off the star about 20,000 years before the supernova explosion. The neutron star is probably there, researchers say. Today, however, it may be too feeble to see. Or perhaps it was short-lived. If more material rained down after the explosion, the neutron star could have gained too much weight. Then it might have collapsed under its own gravity to form a black hole. Right now, there’s no way to tell. Answers to this mystery and others will depend on new and future telescopes. As technology advances, new facilities keep providing fresh looks at the remains of 1987A. Chile’s Atacama Large Millimeter/submillimeter Array, or ALMA, now combines the power of 66 radio-telescope dishes. In 2012, it used 20 antennas to peer into the heart of the explosion’s debris. ALMA is sensitive to electromagnetic waves that can penetrate clouds of debris surrounding the supernova site. “That gives us a look at the guts of the explosion,” McCray says. Within those guts lurk solid grains of carbon- and silicon-based chemicals, researchers reported in 2014. These would have formed in the supernova’s wake. Such dust grains are important ingredients for making planets, astronomers believe. Supernova 1987A appears to be creating a lot of this dust. That suggests that stellar explosions play a crucial role in seeding the cosmos with planet-building material. Whether that dust survives shock waves that are still ricocheting around the leftovers of the supernova is still unknown. From Earth, the universe can seem unchanging. But over the past 30 years, 1987A has shown us cosmic change on a human timescale. A star was destroyed. New elements formed. And a tiny corner of the cosmos was altered forever. As the closest supernova seen in 383 years, 1987A gave people an intimate glimpse of one of the most fundamental and powerful drivers of evolution in the universe. See the futher references with links on the full article. Almost 30 years ago, astronomers and the public saw the closest and brightest modern supernova ever seen by humanity, now known as supernova remnant SN 1987A. Today, researchers paint a picture of the star’s life long before its death. Using the Murchison Widefield Array (MWA) placed in the remote area of the Australian outback, astronomers are able to look into the past of a certain star millions of years before its infamous explosion. Researchers at the University of Sydney and an international team of astronomers have used the lowest-ever radio frequencies to piece together our understanding of stellar explosions, and specifically that of SN 1987A. The results are published in the Monthly Notices of the Royal Astronomical Society. By studying the cosmic ruins of the star’s collapse in 1987, astronomers could observe much of the immediate past of this star. The explosion occurred in our neighboring satellite galaxy, the Large Magellanic Cloud. The supernova is located about 168,000 light years away, meaning the event happened that long ago. Only that last 20,000 years or about 0.1 percent of the star’s total lifespan had been observable. The newest insights have been found from the faintest of “hisses” through low-frequency astronomy. This research has enabled astronomers to look back at the supernova’s life millions of years further back than previously possible. 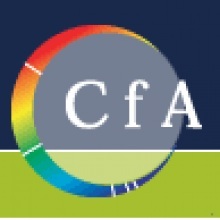 A PhD candidate at the University of Sydney and ARC Centre of Excellence for All-Sky Astrophysics (CAASTRO), Joseph Callingham, led the study under Bryan Gaensler. The radio astronomers were able to look back to when the star was in its red supergiant phase operating the MWA in the West Australian desert. Previous studies have focused on the star’s final blue supergiant phase. “Just like excavating and studying ancient ruins that teach us about the life of a past civilisation, my colleagues and I have used low-frequency radio observations as a window into the star’s life,” says Callingham in a press release. It was found that the red supergiant lost matter at a slower rate and created slower stellar winds than was previously thought. “Our new data improves our knowledge of the composition of space in the region of supernova 1987A; we can now go back to our simulations and tweak them, to better reconstruct the physics of supernova explosions,” says Callingham. The placement of the radio telescope far away from any FM signals was the key to gaining this new knowledge said Gaensler. In a video made by CAASTRO, the star’s past and explosion are shown. Watch the video below.